Cultural manager, translator form the Spanish language. She was the director of the Central and Eastern Europe liaison office of the Swiss Arts Council Pro Helvetia in the years 1999-2014. 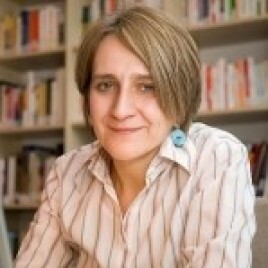 She has worked in the Foundation for the International Cultural Centre in Krakow, was the manager of the Europejska Fundacja Mozartowska (Mozart European Foundation) active in Krakow in the years 1994-1996 and the manager of the Villa Decius Conference Centre in the years 1997-1998. She has published translations of Reinaldo Arenas’ autobiographic novel Zanim zapadnie noc (orig. Antes que anochezca; English edition: Before Night Falls) as well as of two books written by another Cuban dissident, Guillermo Cabrera Infante: Ona śpiewała bolera (orig. : Ella cantaba boleros; English edition: She Sang Boleros) and Moja wina, bo tańczyłem cza-czę (orig. : Delito por bailar el chachachá; English edition: Guilty of Dancing the ChaChaCha).